It is over the failure to protect a key habitat in Strangford Lough - beds or reefs of horse mussels. 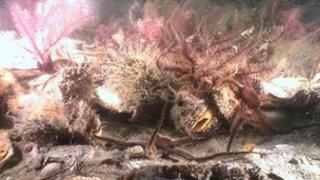 Two government departments had promised Europe we would protect the mussels back in 2006 and narrowly escaped a fine. But since then, little has been done and on Thursday the EU started down the road of legal proceedings. In a few month's time, unless they can persuade the European Commission otherwise, the Departments of Environment and Agriculture will find themselves in the European courts, charged with breaching European directives. Strangford Lough is an area of special scientific interest (ASSI), a special area of conservation (SAC) and a marine nature reserve. It is one of the most protected areas of Europe, in theory. But in reality there has been little protection put in place. It was discovered around 2000 that a number of the mussel beds were damaged and dead. With over 100 other species relying on the reefs formed by the mussels deep on the seabed as their habitat, the situation became critical. Following a formal complaint to Europe, fines were only avoided because Europe was promised that the mussels would be protected and restored. That was in 2006, but it never happened. Using Freedom of Information legislation, the BBC obtained emails sent between the Department of Environment and the Department of Agriculture. In one email a department official revealed "... if the commission asked what progress has been made, the departments will be exposed..."
In another email it was admitted that if Europe discovered what they had not done, "the commission would hang us out to dry". But still little was done. When it was apparent that little had been achieved, the Ulster Wildlife Trust made a second complaint to Europe last November. The European Commission has now written formally to the two government departments. It has raised concerns over the protection of the remaining mussels, the management of activities on the lough and the restoration of the reefs. Unless the departments can persuade the European Commission otherwise, they could face a fine of at least £8m plus a fine of tens of thousands of euros for every day the problem persists. And they have only weeks to make their case following the formal warning they have just received from the commission. "Our response must be decisive," said environment minister Alex Attwood. "We need to demonstrate that the horse mussel reef issue is being conclusively addressed. We have until May this year to convince the EU that any deterioration is being addressed, beyond which infraction awaits." The BBC understands that Mr Attwood has meet with senior EU officials in Northern Ireland and Brussels to try and reassure the commission. But it will be the Department of Agriculture who will have to do the lion's share of the reassuring. Only they can introduce the necessary protection required by Europe and it needs to be done immediately. Agriculture Minister Michelle O'Neill said that she is disappointed with the commission's interpretation of the situation. "I am determined to develop a response which fully matches our responsibility under the Habitats Directive," she said. "I have undertaken to meet fishermen in the near future to discuss options with them and officials from both departments will be working hard together to develop a satisfactory management regime for the future." But that may not satisfy Europe. They have made it clear that at this late stage they are looking specific action, not options. With just a few weeks until the May deadline there is little time for more discussions. Heather Thompson, chief executive of the Ulster Wildlife Trust, who made the latest complaint, told the BBC: "We hope that the action taken by the European Commission will force our government to take its environmental governance role seriously and ensure the appropriate management of Strangford Lough. "The Ulster Wildlife Trust now urges our politicians to do what is needed to fulfil our European legal obligations and stave off potentially costly infraction fines." The departments have just 10 weeks to salvage the situation and the clock is ticking.